Jeddah, Saudi Arabia, 11th April 2018: The sixth edition of The Hotel Show Saudi Arabia and second annual Stone & Surface Saudi Arabia were opened Tuesday (10th April 2018) by His Excellency Faisal Alfadl, Secretary General of the King Saud Foundation and Founder of the Saudi Green Building Forum. AlFadl also hosted a full-day ‘Green Building Workshop’ during the first day of the events at the conference at Stone & Surface Saudi Arabia, detailing Saudi’s position as a world leader in sustainable construction, with an “intelligent cities” green built environment on its horizon. Thousands of hospitality and construction industry professionals are anticipated to descend on Jeddah for the major trade events running together at the Jeddah Centre for Forums and Events for three days, 10-12th April 2018 (4-10pm daily). The events come at a time of record levels of activity across the Kingdom in the hospitality and construction markets. A TOPHOTELPROJECTS report prepared ahead of The Hotel Show revealed 55,810 new hotel rooms are in the Saudi construction pipeline, the majority of which will open in the next five years. Meanwhile, according to BNC Network, Knowledge Partner of Stone & Surface Saudi, there is a massive 4,778 total construction projects underway across the country, led by urban development and a growing transport network. Speaking at the opening of the co-located annual tradeshows for 2018, Gary Williams, Event Director of The Hotel Show Saudi Arabia, said: “The hospitality industry in Saudi Arabia is going through its most significant period of change to date, with major hotel and restaurant brands from all over the world recognising its incredible growth potential based on its long-term investment, business and tourism prospects. “Not only does the Kingdom have the largest population in the Gulf and a robust domestic tourism market, forecasts by the World Travel & Tourism Council predict international tourist arrivals to grow from 18 million in 2017 to more than 30 million in 2027. Investment in infrastructure, major leisure and culture focused tourist attractions, and new visa rules are all part of the vision to put the Kingdom on the global tourism map. Major brands taking part in The Hotel Show Saudi Arabia 2018 include: Unilever Food Solutions, KAAS Group, Schneider Electric, RAK Porcelain, Aldar Almadania, CMT Technologies, SecuTronic, Delta Marketing, Sporta, Technogym, alongside many more. 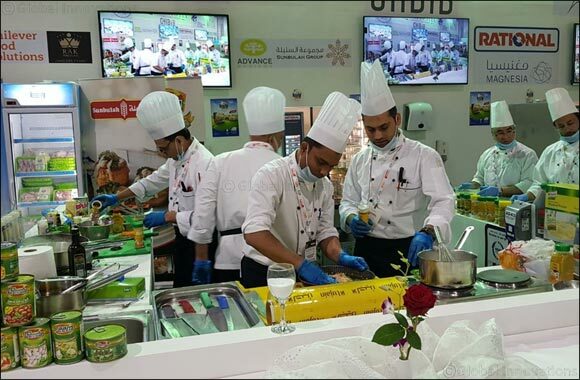 This year’s event also features the highly-anticipated second edition of the ‘Inter-Hotel Culinary Competition – Mystery Box Challenge’ where chefs from the country’s leading hotels are set to battle it out in a bid to be crowned the top hotel kitchen in Saudi Arabia. Meanwhile Stone & Surface Saudi Arabia 2018 is providing a vast international showcase of the latest stone and surface design materials from 12 countries including Saudi Arabia, Turkey, China, Canada and Italy. Yan Wang, Event Director of Stone & Surface Saudi Arabia said: “The Kingdom of Saudi Arabia currently has a wealth of cutting-edge, iconic architecture and design projects under construction alongside mega public projects including the new airport in Jeddah and Haramain Rail Line Project – set to connect the country like never before. A free-to-attend, CPD-certified conference is also being introduced to the event line-up this year, featuring expert speakers set to update the Kingdom’s professionals on the latest developments and trends in the construction industry including experts from JLL and the Saudi Green Building Forum. Co-located The Hotel Show Saudi Arabia 2018 and Stone & Surface Saudi Arabia 2018 are free to attend events. On-site registration is now open daily from 4pm at the Jeddah Centre for Forums and Events until Thursday (12th April 2018).